Monday night I watched RuPaul’s Drag Race; Tuesday night I saw The Huntsman: Winter’s War. The former understands the appeal of smartly subverting stale entertainment tropes (the queens were making political campaign videos) and werqing wigs, side eye and over-the-top dresses. Sadly, the same cannot be said of the latter. 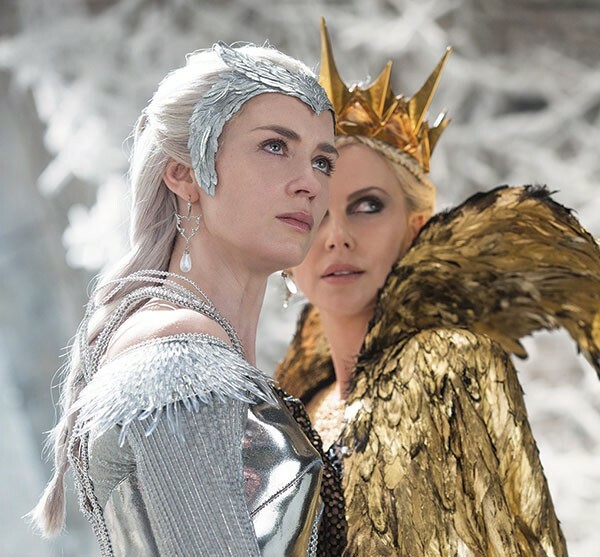 Essentially, there are two feuding, epically bewigged royal sisters — Ravenna (Charlize Theron) and Freya (Emily Blunt). There’s the matter of a dead baby, and an object of desire — a mirror of unclear properties, except it’s better to have than not. (Like Gollum’s infamous ring, it must be kept under wraps lest staring at it bring out darker tendencies.) There are also two humans — Jessica Chastain and Chris Hemsworth — fighting for love and happiness; they are grubby, but rocking their own good hair. Most of the production budget went to Freya’s winterland palace (its floors are icy slush! ), and Blunt does deliver emotionally bruised ice-queen realness, with silvery headpieces and a chain-mail cape that tinkles ominously. Ravenna gets tackier looks — cosplay talons and a dress made from gold feathers — but Theron gives it some amusing slither. It’s a paycheck, ladies, though you gotta feel for Blunt struggling to maintain her dignity while riding whatever furry animal they harvest bathroom rugs from. Winter’s War is not without humor, mostly delivered by Hemsworth (who has the insouciance of somebody who didn’t have anything better to do that weekend) and four full-sized actors digitally shrunk into sniping dwarves. But it lacks self-awareness about its campier elements. We’re supposed to fear the mirror, not laugh when it oozes gold drapery. And like Drag Race, the film essentially boils down to a battle between two extravagant ballgowns — here, one silver, the other gold — but without Ru’s snappy patter.